Black spot is a fungal disease (Diplocarpon rosae) that affects roses. The fungus develops as black spots on the leaves, which eventually causes the leaves to turn yellow and drop off. Besides looking unsightly, it can seriously weaken the rose plant. Black spot thrives during hot, humid, or rainy summers and hot days with cool, damp nights. What Does Black Spot Do? Black spot will look like somewhat circular black spots on leaves. It usually occurs on the upper sides of leaves, but can also develop on the undersides. The outer margins of the black circles are ragged or feathery and they are usually surrounded by a ring of yellow. Spots begin on the lower leaves and move upward. They can appear as early as when the leaves first unfurl. These spots can enlarge and eventually merge. Affected leaves often fall off the plants, and if left unchecked, the entire plant can defoliate. The fungus can also infect young canes, causing dark purple or black blisters on the canes, and even the flowers may show some red spotting. Infected plants will set fewer flower buds and without leaves, the plants become stressed and susceptible to more problems. Black spot is easier to prevent than to cure. Existing spores can remain in the soil and overwinter on leaves and stems, waiting for favorable conditions. The spores make contact with the rose by splashing onto it in drops of water. Give the plant ideal growing conditions: True for avoiding any plant disease, a healthy, vigorous plant is less susceptible to problems. Roses prefer a sunny location with well-draining soil and regular, weekly watering. Good air flow: Provide good air circulation around and through your rose plants. Do not plant your roses too close to other plants. Prune to open the spaces between canes, if the plant gets too dense and air cannot get through. Proper watering: Avoid getting the leaves wet while watering. There is not much you can do about rain, but at least limit the time the leaves remain wet. Plant-resistant cultivars: Roses are often labeled for resistance, from highly resistant on down. 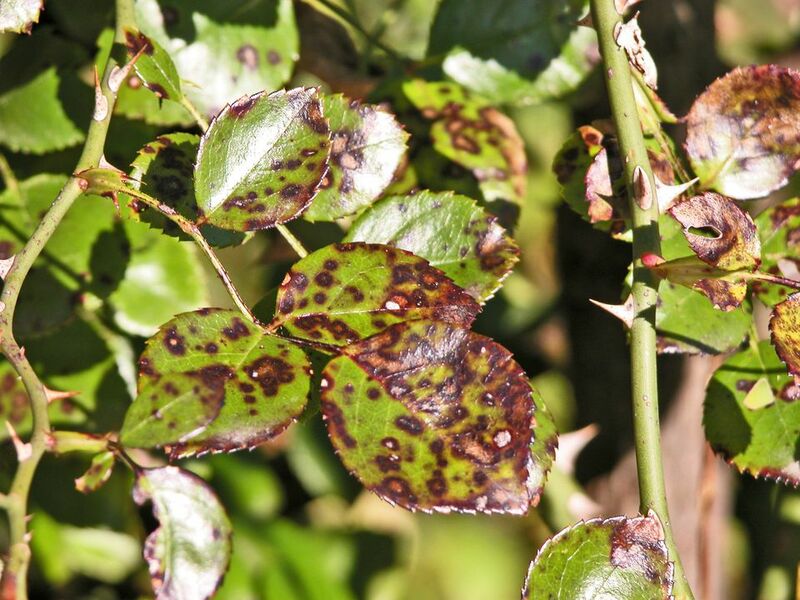 If you are looking into black spot-resistance, you might as well look for a rose that is also resistant to rust and powdery mildew. Rugosas, a newer shrub and ground cover rose, and many of the Canadian Explorer series rose like "John Cabot" and "William Baffin," show good resistance. Pruning: Remove any infected leaves and always do a thorough cleanup each fall. Remove and dispose of any remaining leaves when you do your dormant pruning in late winter/early spring. Spores can remain on leaves and stems and can reinfect whenever conditions are favorable. Within 10 days of the first symptoms, the disease has already started spreading. Spores can spread by water and wind. Prune out any canes showing signs of infection. Prune 6 to 8 inches below the infection and only prune in dry weather. Disinfect your pruners with a 10 percent bleach solution or alcohol between cuts. Mulch: Apply a thick layer of mulch around the plants. Mulch will prevent water from splashing up on the plant and spreading spores. There are commercial and homemade, DIY-solutions you can use to try to cure black spot. The treatment may seem time-consuming; it is a pesky problem. And, if after you have treated it, the black spots reoccur, you may need to spray your plants weekly starting in early spring. Baking soda spray: Dissolve 1 teaspoon baking soda in 1 quart of warm water. Add up to 1 teaspoon of liquid soap. Spray leaves thoroughly. This mixture works better as a preventive than as a cure. It also offers some protection from powdery mildew. Bordeaux mix: This is a fungicide that contains copper sulfate and hydrated lime. It can be used as a powder or mixed with water and sprayed. Bordeaux mix also repels some insect pests, but it can burn plant leaves. It is generally used as a preventative in the spring before plants leaf out. Insecticidal soaps with added fungicide: You can use an organic fungicide, which is often sulfur added to regular insecticidal soap. The soap coats the leaves and helps the fungicide adhere to the plant. Neem oil: Neem is an organic fungicide and pesticide, derived from the seeds of the neem tree. It gets inside the plant's system, so you do not need to worry about coating everything or reapplying after rain. However, it can burn plant leaves in the hot sun. You should not apply neem oil within two weeks of using a product containing sulfur. Sulfur: Sulfur prevents and gets rid of fungus diseases. It is also used to control several insect pests. However, it can be mildly toxic to humans and other animals. You should wear protective clothing when you spray it. It can also corrode metal, so use a plastic sprayer. And it can burn plants leaves in hot weather. Sulfur comes as a finely ground powder. If you prefer to spray it on, look for one that is labeled as wettable so that it will mix with water.